In New York Times best-selling author Lisa Scottoline's electrifying, Edgar-nominated first novel in her Rosato & Associates series, a young lawyer at an all-female law firm must stay one step ahead of a stalker who has a deadly agenda. Mary DiNunzio has been slaving away for the past eight years trying to make partner in her cutthroat Philadelphia law firm. She's too busy to worry about the crank phone calls she's been getting - until they fall into a sinister pattern. The phone rings as soon as she gets to work, then as soon as she gets home. Mary can't shake the sensation that someone is watching her, following her every move. The shadowboxing turns deadly when her worst fears are realized, and she has to fight for something a lot more important than partnership: her life. Main character is smart ,strong & weak in the correct incidents exactly how reader would hope to be. I purchased this novel and several others during Audible's first in a series sale last month. Attorney Lisa Scottoline's legal thrillers, all 30+ of them, include a lot of discussion of feelings, a bit of Catholic guilt, female lawyers, and at least one legal case. Of those I have read or listened to there is at least some feeling of chick lit, really good chick lit!. Mary DiNunzio, the protagonist of this one, has lost her husband to murder and her best male friend to murder, both literally road kill. There is a nice twist near the end which identifies the culprit. Mary and Judy Carrier decide to form their own legal firm at the end of Everywhere That Mary Went. Nevertheless, this is the weakest of Scottoline's legal thrillers, so don't this let this novel discourage you from others of her novels. Narration is better than the novel. As usual a terrific Mary DeNunzio story!! As a follower of the writer and also enjoyed every book so far performed by the narrator I can only say this combination is terrific, I always keep interest to the end and of course looking forward to the next, for myself time flies as the plot develops. I do recons not only this title but all from Scottline. 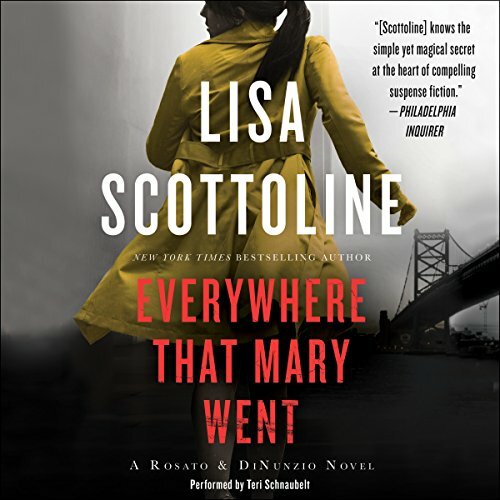 Would you consider the audio edition of Everywhere That Mary Went to be better than the print version? I haven't read the print version, but my guess is yes. What does Teri Schnaubelt bring to the story that you wouldn’t experience if you just read the book? This is the second book I've read in this series, the plot is great and you want to know what happens, but at the same time you really want to know the back story to this stuff. This is what I really like about this book. I did have a thought provoking part of the book but I won't include spoilers. This book wasn’t the greatest. Boring and slow but the narrator was great. Only buy this is you have a credit or can’t find anything good. Kind of a disappointment because I’ve loved her other books. Really finding it hard to fathom how this book got such good reviews. The leaps in logic seemed to know no bounds. The leaps in emotions too. My eyes hurt from rolling so much. I will say the narration was excellent but the story itself was horrendous. It also seemed a little odd describing it as a legal thriller. The main character was a lawyer, but the legal aspect played little part in the book. The little legal aspect that was in the book was completely unrealistic and unsatisfying. The characters had no depth whatsoever. If this had been the first Scottoline book I'd ever listened to it would have been the last, but since this was written in the 90's I'll let it go. The ridiculous political comments, the religious rants were obnoxious and petty. I would never listen to another of the books in this series, the protagonist is truly unlikeable. I generally like the narrator but in this case she just didn't live up to her other performances. Just an all around disappointment. This is one of the worst books I listened to. Completely boring and the reader doesn't make it any better. I strongly do not recommend. I have read/ listened to several Lisa Scottoline books, this is the worst book of hers and one of the most boring I have read/ listened to ever. Loved it, can't wait for the sequel to come out! Just as entertaining as Lisa's other books! !